Anastomotic leaks are defined as ‘a leak of luminal contents from a surgical join‘. 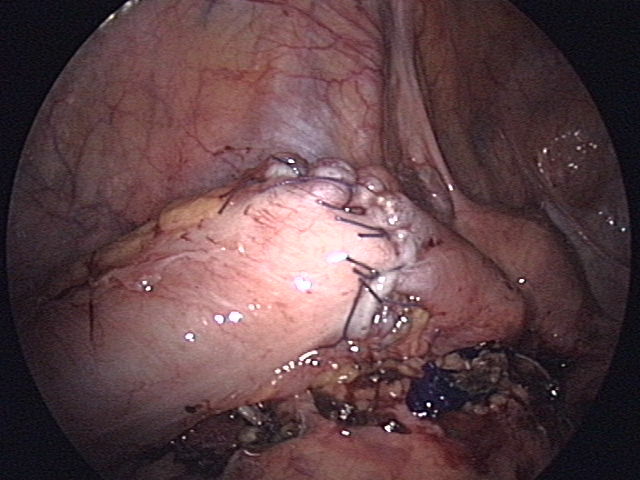 They are the most important complication to recognise following gastrointestinal surgery. Early diagnosis, resuscitation and treatment of an anastomotic leak is key. Delay leads to prolonged contamination of the abdomen or chest by the luminal contents, leading to the development of severe sepsis and progression to multi organ failure and death. It is important to remember that any patient who is not progressing as expected or who deteriorates after surgery should be considered to have an anastomotic leak until proven otherwise. In this article, we shall look at the risk factors, clinical features and management of an anastomotic leak. The most common clinical features of an anastomotic leak are abdominal pain and fever. They usually present between 5-7 days post-operatively. Other features* may include delirium or prolonged ileus. On examination, patients may be pyrexial, tachycardic, and/or with signs of peritonism. It is important to check for any faeculent / purulent material or bile in any drains. *Remember, any patient with systemic sepsis or is not improving as expected (“failing to progress”) after a GI resection should be considered to have an anastomotic leak until proven otherwise. The definitive investigation for a suspected anastomotic leak is a CT scan with contrast of the abdomen and pelvis (or chest, abdomen and pelvis for an intra-thoracic anastomosis), which will demonstrate the presence of any extraluminal contents. Ensure early resuscitation and senior input for any suspected cases. Other initial investigations should include is urgent blood tests, including FBC and CRP, U&Es, LFTs, and a clotting screen. A venous blood gas will assess degree of tissue perfusion. A repeat Group and Save will be needed for possible surgery or radiological drainage. Once an anastomotic leak has been diagnosed, the key immediate principles in management relate to the treatment of the potential contamination and resultant sepsis. Any suspected anastomotic leak requires urgent senior review. Ensure the patient is nil by mouth (NBM) and start broad spectrum antibiotic cover (as per local guidelines). Start IV fluid therapy and insert a urinary catheter to enable monitoring of fluid balance. The definitive management varies depending on the extent of the leak, extent of contamination, and the physiological status of the patient. Minor leaks may be managed conservatively. Collections <5cm will usually settle with intravenous antibiotics, however larger ones commonly need to be drained percutaneously if possible (although many are inaccessible because of being covered by bowel). If the patient is septic or has multiple collections then exploratory laparotomy is often required. This generally involves extensive wash outs with large drain insertion; in the case of a leaking colo-rectal anastomosis, this also usually requires a stoma to be fashioned. Whether the leak is managed operatively or conservatively, it is essential to pay close attention to the patient’s nutrition and act pre-emptively (including considering parenteral nutrition if the patient is likely to be NBM for extended period of time). 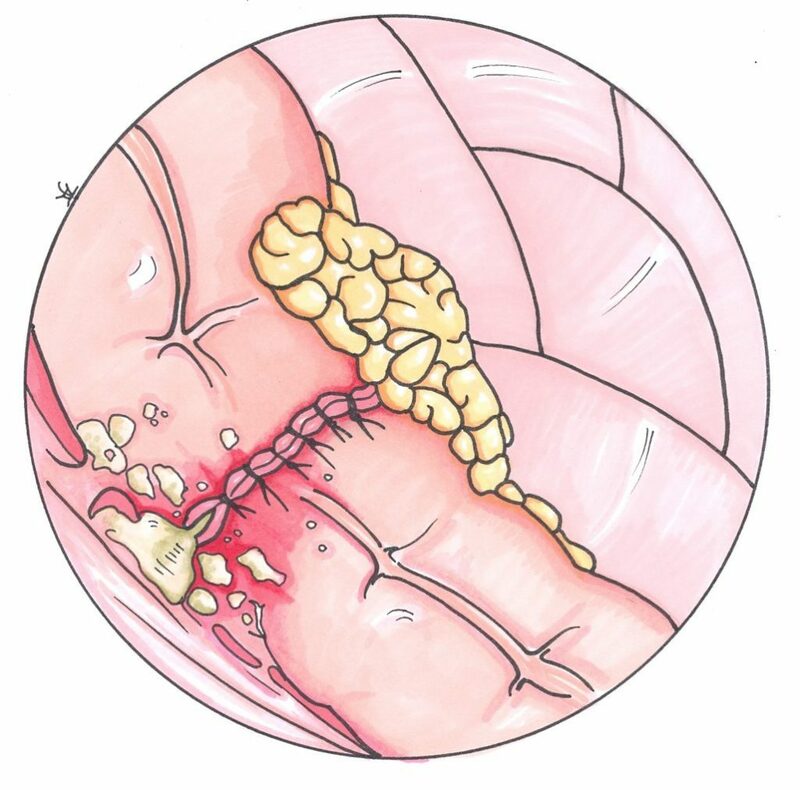 Figure 2 – Anastomosis of the sigmoid colon, following bowel resection secondary to diverticular disease. Which of the following is NOT a risk for developing an anastomotic leak? How long after surgery do anastomotic leaks usually present? What is the definitive investigation for a patient with suspected anastomotic leak?